Villanova 16, St. Bonaventure 3: JP Radvany finished 3-for-6 with three RBIs, and Timothy Lilly hit a grand slam in the ninth to lead the Wildcats to their first win of the season. Jimmy Kingsbury was solid over 7 1/3 innings, surrendering three runs on eight hits to notch the W.
La Salle 13, Albany 6: Ben Faso hit a two-run homer to highlight a six-run sixth inning that lifted the Explorers to a win. He finished the afternoon with five RBIs. Ryan Guckin chipped in with three hits while Colin Scanlon tossed 3 1/3 scoreless innings in relief to collect the win. He struck out four. UNC-Greensboro 5, Penn 3 (GM 1): Sean Phelan picked up a pair of hits and two RBIs while Christian Scafidi tossed 5 2/3 innings surrendering three runs - two earned - on five hits and three walks. UNC-Greensboro 6, Penn 5 (GM 2, 13 inn. ): Matt O'Neill finished 3-for-4 with a double and a homer while Chris Adams and Sean Phelan also collected three hits each in the losing effort. 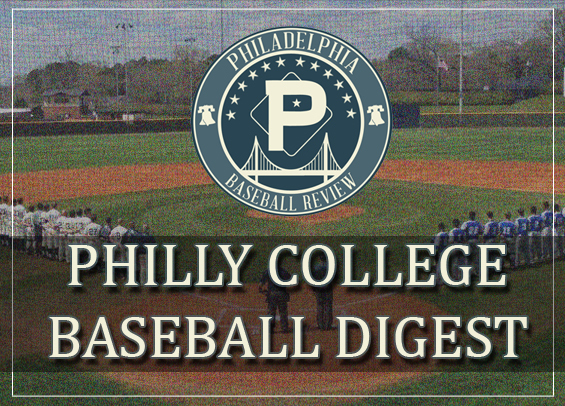 Jacob Sadowitz surrendered a walk-off homer in the 13th to doom the Quakers. Tulane 12, Saint Joseph's 7: Andrew Cossetti homered and Nate Thomas finished 3-for-4 with a pair of RBIs. Grant Calvarese took the loss, surrendering five runs on six hits in relief over 1 2/3 innings. Jake Meyers made the start, collecting six strikeouts over 4 2/3 innings. Army 11, Saint Joseph's 5: Andrew Cossetti and Matt Cuppari each had a pair of hits in the loss. Jordan DiValerio failed to get through three innings, tossing 2 2/3 while surrendering six runs on five hits a pair of walks. Florida Memorial 6, Chestnut Hill 4 (GM 1): Luke LeBeau hit a pair of doubles in his collegiate debut and finished 2-for-3 for the Griffins. Billy Bethel tossed five innings, surrendering four runs on seven hits. Flordia Memorial 7, Chestnut Hill 2 (GM 2): Andrew Dietz finished 2-for-4 to pace the Griffins offense. Matthew Kress gave up 12 hits and seven earned runs over 5 2/3 innings in the losing effort. Texas-Tyler 7, USciences 6: Justin Derk issued a pair of walks and then surrendered a walk-off double in the final frame to doom the Devils. Nate Steele collected three RBIs on two hits and Jacob Whittington homered and scored twice. Louisiana College 11, Gwynedd Mercy 5: No details available. Hanover 2, Cabrini 0: Drew Jackson tossed seven strong innings, surrendering one run on four hits. He struck out eight. Garrett Laraia led the Cavs at the plate with two hits. The loss snapped a four-game winning streak. Penn State Abington 11, Neumann 10: A seven-run eighth inning lifted the Nittany Lions past the Knights in a match-up of local D-III programs in Florida. Darren Aupperle finished 3-for-4 for PSU while Tyler Dipatri, Brett Guaglionona, and Jaden Himmelreich collected two RBIs each. For the Knights, Tyler Ramos finished 3-for-5 with three RBIs while John Lindeborn homered and Danny Padilla finished with a pair of hits.